The Gaslamp recently opened in River Park Square. With a bright orange bike hanging from the ceiling, what appears to be grass surrounding their sign and stacked rows of potted herbs built into the back wall, walking into River Park Square's newest bar and restaurant feels a little like stepping out onto your backyard patio — except probably a bit hipper. 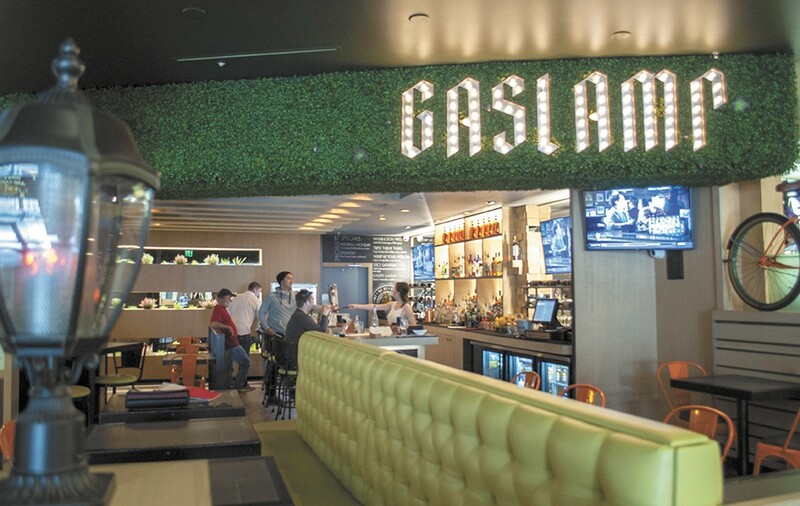 Gaslamp is now open right outside the AMC movie theater ticket counter on the shopping center's third floor, and the eatery's operations manager, Jason Martinez, says it's been fun figuring out how to transform this fairly small space into what they were envisioning. Wanting to provide an option for a fast bite or cocktail, Gaslamp's menu was created with moviegoers in mind. "The word is quick," Martinez says. "We want to provide a good product with good — but also quick — service." Gaslamp's cocktails incorporate higher-end liqueurs and spirits, hoping to remind folks of the variety of food, drink, shopping and entertainment the mall offers. "We talked about how we wanted to do higher-end cocktails, but we didn't want them to be pretentious or the kind that would take 10 minutes to make," says Martinez. Their cocktail list features many classic drinks with new twists, quite a few martinis, and yes, the herbs growing in the back wall are incorporated into their cocktails. Each drink requires three to five steps to create and costs between $8 and $12. Their most popular cocktail so far has been the Manhattan Smoke Show ($12) — Woodford Reserve, vermouth and applewood smoke served over an ice ball. Martinez describes this drink as one that incorporates the guest into its creation. The bartender asks each guest how smoky they would like the cocktail, then smokes the whiskey right there in front of them. 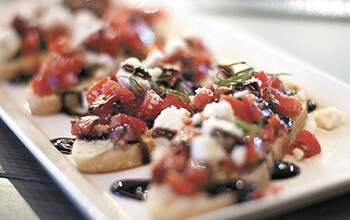 Their food offerings include appetizers, soups, salads, paninis and a few entrées, all made from scratch. There's a separate section for their slider options—portobello, meatball, pulled pork and chipotle chicken ($3 each).